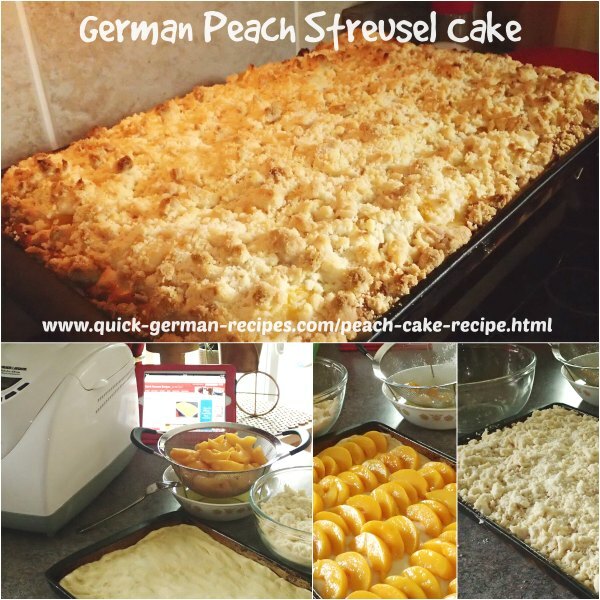 Want a German Peach Cake recipe that's easy to make and wonderful to eat, especially warm out of the oven? This Pfirsich-Streuselkuchen is a bread machine cake recipe for a yeast dough. It is then followed by a quick finishing off by hand before baking in the oven. You can make it with streusel topping as shown or omit the streusel, if you wish. 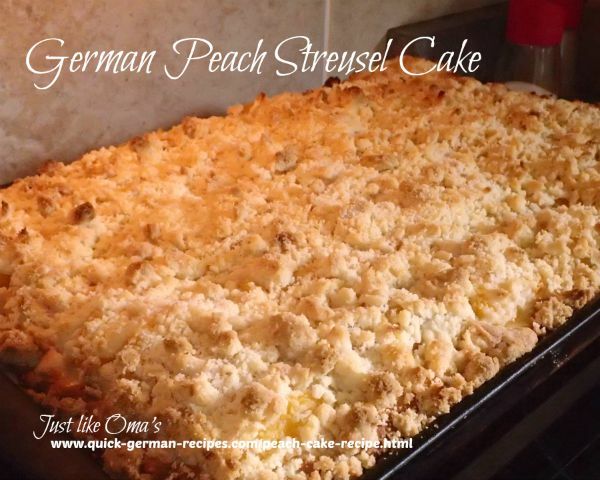 Best served fresh, this Peach Streusel Cake also tastes great and keeps for several days due to the fruit keeping the yeast base moist. Put all the Yeast Dough ingredients into the Bread Machine pan. Use the "dough" setting and start (usually takes about 1½ hours). Grease a 15" x 11" baking sheet. Once dough cycle is finished, pat dough onto baking sheet. Pierce dough all over with a fork. Arrange fruit on dough in rows. Let rise in a warm place about 15 minutes. Bake 25 - 30 minutes or until yeast pastry is puffed up and golden between the fruit. Cool slightly in pan then cut into squares. Serves about 8 - 10. I used canned peaches for this one, and you may find that you'll want to use 2 cans of peaches if you want more fruit on top. However, you can change it by adding different fruits. Can't use this bread maker recipe because you don't have a bread machine. Don't fret. You can make the yeast dough as in the Poppy Seed Cake and finish it the same way as here. Want something a bit different? 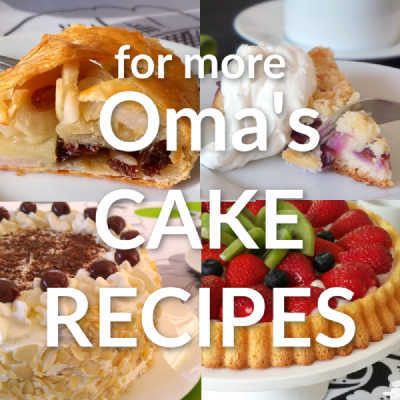 Omit the Streusel Topping and sprinkle with ⅓ cup sugar crystals and ½ tsp cinnamon after it is baked. If you want to make this a German Plum Cake, Pflaumenkuchen, use 2 lb fresh prune plums, wash and pit, cutting plums lengthwise into quarters. Place them in rows over the dough. Let rise. Cover with streusel or sprinkle with sugar. Bake. Enjoy! "Lazy people want much but get little, but those who work hard will prosper." Here's a peach cake recipe you'll love to make. With a yeast cake base, covered with peaches and a streusel topping, you'll be singing 'Wunderbar' all day long!.